Reference number for this case: 8-Oct-54-Metz. Thank you for including this reference number in any correspondence with me regarding this case. 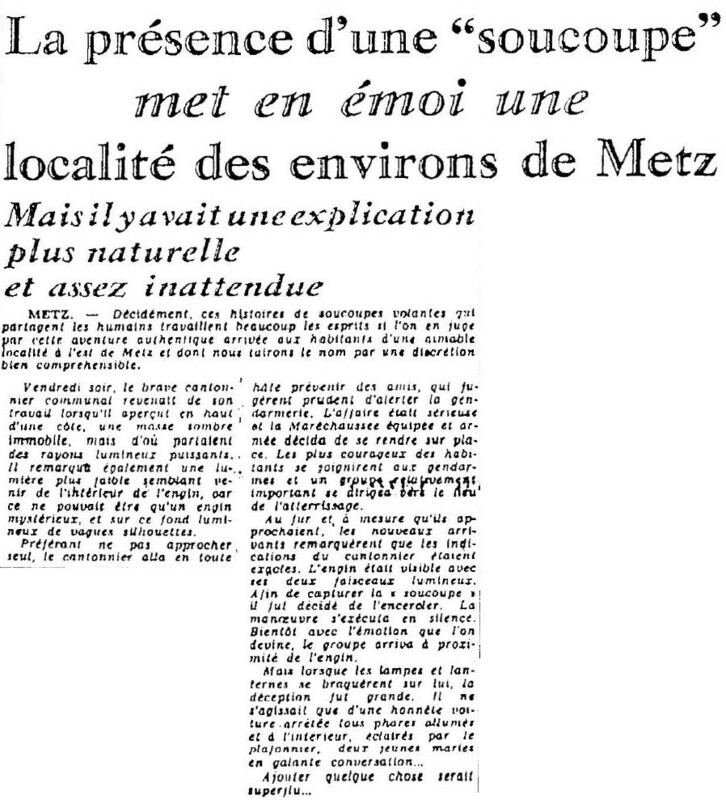 The regional newspaper Le Républicain Lorrain for October 10, 1954, told in an "amused" tone that a "saucer" had excited a locality around Metz, while there was "a more natural and quite unexpected explanation." The newspaper told that "this authentic adventure" happened to the inhabitants "of an amiable locality east of Metz and whose name we will keep quiet by a very understandable discretion." On the evening of October 8th, the "brave communal roadmender" was coming back from his work when he saw at the top of a hill a motionless dark mass from which powerful rays of light started, with a weaker glow seeming to come from the inside of the craft, and on this bright background, vague silhouettes. Preferring not to approach alone, he alerted some friends, who thought it safer to alert the gendarmerie, who went there. The bravest of the inhabitants joined the gendarmes and a relatively large group headed for "the landing site". The roadmender's indications were correct, but when people circled the saucer, and pointed at it their flashlights and lanterns, "the disappointment was great" because it was only a stopped car with all headlights on, and inside, lit by the ceiling lamp, two newlyweds "in gallant conversation." This was published in 1995 in the UFO catalog of Raoul Robé of CNEGU, who correctly comments that it was either a misinterpretation caused by a car and its occupants, or an invention of the newspaper, because the place and the names were silenced. But this did not prevent Albert Rosales, in his catalogs of "humanoid encounters" compiled in the 2000s, to summarize the affair, as if it were an authentic encounter with extraterrestrials, even though he indicated that Raoul Robé was his source. METZ. -- Certainly these stories of flying saucers that humans share work very much on the minds if we judge by this authentic adventure that happened to the residents of an amiable locality east of Metz whose name we will hide by understandable discretion. On Friday evening the brave communal roadmender returned from his work when he perceived a motionless dark mass at the top of a hill, but from which powerful rays of light were emitted. He also noticed a lighter gleam appearing to come from the inside of the craft, for it could only be a mysterious craft, and on that luminous background, vague silhouettes. Preferring not to approach alone, the roadmender went in haste to alert friends, who thought it more prudent to alert the gendarmerie. The matter was serious, and the Law Enforcement people decided to go to the spot. The most courageous of the residents joined the gendarmes, and a relatively large group made its way to the landing place. As they approached, the newly arrived noticed that the information of the roadmender was accurate. The machine was visible with its two luminous beams. In order to capture the "saucer" it was decided to encircle it. The maneuver was executed in silence. Soon with the emotion that one guesses, the group arrived near the machine. On Friday, October 8, 1954, in the evening a communal road mender returns from his work to his home, a locality east of Metz (57), when he sees at the top of a hill a dark immobile mass, from where powerful light rays are coming. He also notices a dim light that seems to come from inside the craft and vague silhouettes. Frightened the witness runs to look for villagers who immediately warn the gendarmerie (1). Everyone approaches the "illuminated saucer" and eventually find that it is a car stopped all lights on. The ceiling light illuminates a couple surprised by this untimely bustle. Explanation: it is either a mistake with a car and its occupants. a hoax of the press (everything is anonymous: names, places). Source: newspaper Le Républican Lorrain of 10/10/1954 (see page 35). A road worker was on his way home when he encountered an immobile dark mass near the ground. The dark mass emitted powerful beams of light. Through an opening the witness saw a weak light and several vague moving silhouettes. Frightened he ran to the village to notify the police. The object had disappeared when the witness returned with others. As stated by Raoul Robé, this was either a misinterpretation, a car and its occupants, or an invention of the newspaper. The version by Albert Rosales is totally dishonest. [rl1] Article in the regional newspaper Le Républicain Lorrain, France, October 10, 1954. [rr1] "Catalogue Régional d'Observations d'Humanoïdes - 3ème édition", compiled by Raoul Robé, in the annual ufology magazine Les Mystères de l'Est, CNEGU, France, #1, page 15, 1995. 0.1 Patrick Gross February 26, 2005 First published. 1.0 Patrick Gross January 26, 2009 Conversion from HTML to XHTML Strict. First formal version. 1.1 Patrick Gross October 7, 2014 Addition [ta1]. 1.2 Patrick Gross December 5, 2016. Addition [rl1]. Explanations changed, were "Not looked for yet.". 1.3 Patrick Gross February 8, 2019 Addition [rr1], Summary. Explanations changed, were: "Misinterpretation of car and people inside. The only question that remain is whether it was Raoul Robé or Albert Rosales or someone else previously who censored the explanation clearly given in the newspaper [rl1], necessarily the source of the case. The case does not appear in the version of "Catalogue Régional" by Raoul Robé published in October 1986 in the French ufology magazine 'Lumières Dans La Nuit'." This page was last updated on February 8, 2019.